Millard Fillmore was born in 1800. He was the son of (?) Fillmore and Phoebe Millard. Millard Fillmore died in 1874. 13th President of the United States of America. 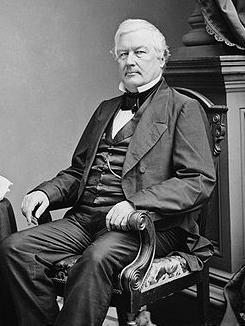 Made president after the sudden death of President Taylor, Vice-President Millard Fillmore made his mark on the country by signing the Compromise of 1850 in an effort to avoid Civil War. (?) Fillmore married Phoebe Millard, daughter of Abiathar Millard and Tabitha Hopkins. Married Name Her married name was Staats. Margaret Chandler married Elijah Staats, son of Jacob Staats. Margaret Chandler was born in 1778. She was the daughter of Enoch Chandler. Margaret Chandler died in 1855. Enoch Chandler was born in 1755. He was the son of Swithin Chandler. Enoch Chandler died in 1840. Swithin Chandler was born in 1715. He was the son of (?) Chandler and Ann Bowater. Swithin Chandler died in 1773. Married Name Her married name was Chandler. Ann Bowater married (?) Chandler. Ann Bowater was born in 1680. (?) Chandler married Ann Bowater. Married Name Her married name was Dixon. Ann Chandler married (?) Dixon. Ann Chandler was born in 1709. She was the daughter of (?) Chandler and Ann Bowater. Ann Chandler died in 1761. (?) Dixon married Ann Chandler, daughter of (?) Chandler and Ann Bowater. Caleb Dixon was born in 1732. He was the son of (?) Dixon and Ann Chandler. Caleb Dixon died in 1785. Anne Dixon was born in 1759. She was the daughter of Caleb Dixon. Anne Dixon died in 1841. William Dixon was born in 1797. He was the son of Anne Dixon. William Dixon died in 1848. Married Name Her married name was Hardin. Mary Elizabeth Dixon married (?) Hardin. Mary Elizabeth Dixon was born in 1826. She was the daughter of William Dixon. Mary Elizabeth Dixon died in 1885. (?) Hardin married Mary Elizabeth Dixon, daughter of William Dixon. 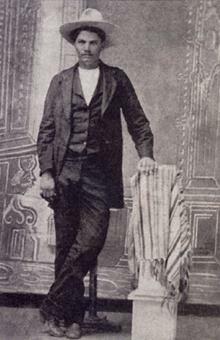 John Wesley Hardin was born in 1853. He was the son of (?) Hardin and Mary Elizabeth Dixon. John Wesley Hardin died in 1895. American Outlaw. John Wesley Hardin was an outlaw and gunfighter in Texas. He was reported to be the meanest man alive, once killing a man just for snoring. Most of his gunplay was a result of his short temper. Married Name Her married name was Moulton. Abigail Webster married William Moulton, son of William Moulton and Margaret Page. Abigail Webster was born in 1662. She was the daughter of (?) Webster and Ann Batt. Abigail Webster died in 1723. Married Name Her married name was Webster. Ann Batt married (?) Webster. Ann Batt was born in 1630. (?) Webster married Ann Batt. Lucy Webster married (?) Merrill. Lucy Webster was born in 1664. Lucy Webster died in 1718. (?) Merrill married Lucy Webster, daughter of (?) Webster and Ann Batt. Abel Merrill married Sarah Bodwell, daughter of (?) Bodwell and unknown (?). Abel Merrill was born in 1690. He was the son of (?) Merrill and Lucy Webster. Abel Merrill died in 1753. Married Name Her married name was Pierce. Elizabeth Merrill married (?) Pierce. Elizabeth Merrill was born in 1728. She was the daughter of Abel Merrill and Sarah Bodwell. Elizabeth Merrill died in 1764. (?) Pierce married Elizabeth Merrill, daughter of Abel Merrill and Sarah Bodwell. Benjamin Pierce married Anna Kendrick. Benjamin Pierce was born in 1757. He was the son of (?) Pierce and Elizabeth Merrill. Benjamin Pierce died in 1839. Franklin Pierce was born in 1804. He was the son of Benjamin Pierce and Anna Kendrick. Franklin Pierce died in 1869. 14th President of the United States of America. A strong background in law, military service and politics brought Franklin Pierce to the presidency of the United States in 1853. During his term the Kansas-Nebraska Act was enacted and the Gadsden Purchase, 45,535 miles of land, bought what now makes up the southernmost area of New Mexico and Arizona. Anna Kendrick married Benjamin Pierce, son of (?) Pierce and Elizabeth Merrill. Rebecca Chase married Stephen Moulton, son of William Moulton and Abigail Webster. Rebecca Chase was born in 1700. She was the daughter of Thomas Chase. Rebecca Chase died in 1769. Thomas Chase was born in 1654. He was the son of (?) Chase and Ann Wheeler. Thomas Chase died in 1733. Married Name Her married name was Chase. Ann Wheeler married (?) Chase. Ann Wheeler was born in 1629. (?) Chase married Ann Wheeler.